Following on from a very successful evening with parents this week, we thought we’d share these top tips from our speaker Noel Janis Norton, Founder and Director of Calmer, Easier, Happier Parenting about managing screen time at home. Screen time is always going to be tricky for parents to manage. But HOW you manage it, can make all the difference. You should be in charge, not your child! This helps parents’ values prevail at home. Use your common sense, and wisdom, to help you decide what is right for your family. Children will always try to convince you that their friends are allowed more time on screens than they are! When deciding the rules, make sure you are very clear about what it is you want. Vagueness can be exploited! Decide rules together with your partner, and/or other carers in your child’s life, (and be prepared to compromise!) so that you can always present a united front. So it helps to have them on side too. Once you have decided upon the screen time rules of your household, share it with your child at a time when everyone is calm, and ideally not just before screen time use. Having explained the rule to your child, ask them to explain it back to you. By getting your child to imagine themselves doing it right, it will help them remember the rule. Having decided on the rule, stick to it. Avoid bartering! Your child will start to respect that you mean what you say if you always enforce the rule. So ensure your child has a variety of other things they can do. Screen time can then be reward for doing sports or practising an instrument for example. Being bored now and again teaches children to be self-reliant, and may even motivate them to get creative and try out other things. Parents shouldn’t have to rely on an electronic sedative to get some time for themselves. Children don’t HAVE to have screen time every day. It is not a human right! 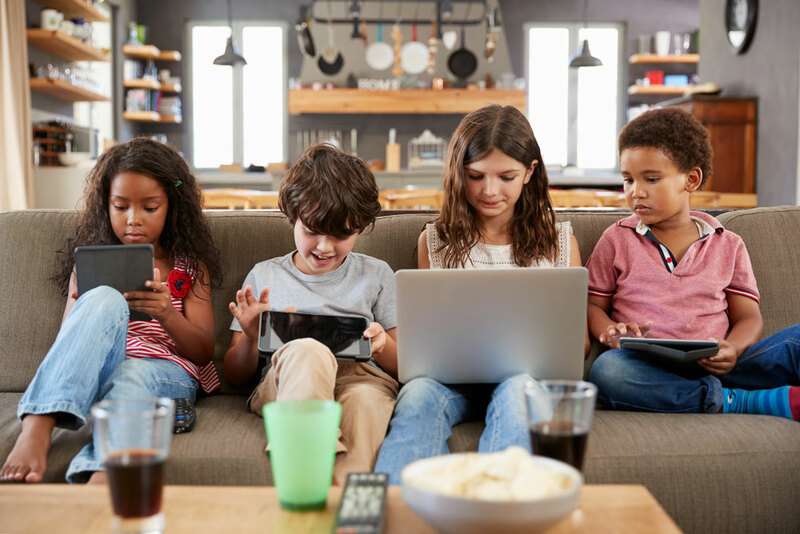 Children often get irritable when they have had screen time and don’t enjoy other activities as much, such as family time at the weekend, so don’t be afraid to introduce a rule about no screen time at all on certain days. …after all, it’s an addiction! Its no good expecting children to reduce screen time if parents don’t do so themselves. They learn more from what we do than what we say. If access to a screen is essential, do so in privacy or at a time when your child is not about. Some families have found that having a basket by the front door to put their phones in as they come in, is a good way of reducing screen time. Screens can keep young people stuck in their bedrooms. This increases a sense of isolation and could mean that their online influence is greater than yours. Consider introducing a family rule to have no screens in the bedroom. …but you need to be savvy to ensure they can’t crack them! Evidence suggests that screen time reduces receptivity to learning. Screens change the brain’s activity, making it more distractible, reactive, irritable and maybe even aggressive. The blue light from screens reduces melatonin levels, the hormone which triggers sleep. …especially if they aren’t behaving well in the mornings. It’s a sign they need to be in bed earlier. …before they can be self-governing about their screen usage. Don’t assume they are as sensible as their height might suggest! And don’t be afraid to tell your child that you don’t trust them yet to use a screen unsupervised. This trust is something they must earn. No screens at meal times. No screens in the bedrooms (get alarm clocks so you don’t have to rely on your phone). Time restrictions for evenings and weekends. Screens can only be used in an area of the house where a grown up can see what the child is doing.